The APx BW52 high-bandwidth option for APx52x Series audio analyzers offers unprecedented FFT performance: 1.2M points, DC to over 1 MHz bandwidth and full 24-bit resolution. No other test instrument can match this bandwidth and resolution combination. Class D amplifiers, converters and switch-mode power supplies produce spurious signals well outside of the 100 kHz bandwidth limit of most audio analyzers. This out-of-band noise can degrade audio quality and even damage components. Before the BW52 option, engineers were restricted to using a spectrum analyzer or an oscilloscope to view out-of-band noise. However, these instruments are expensive and have low impedance, low resolution and limited input tolerance, making them unsuitable for audio design. With the BW52, audio engineers can use one instrument to measure audio and out-of-band at significantly greater resolution than previously available. The BW52 option is available as an option on APx52x Series analyzers. The switching frequency of Class D amps, sigma-delta converters and other modern audio devices often center around 250-300 kHz. Noise that is reflected into the audible range will directly degrade the sound. Noise that remains above the audible range can also degrade the sound by causing problems such as oscillation, overheating and damage to components, loss of headroom, and interference with connected or adjacent equipment. 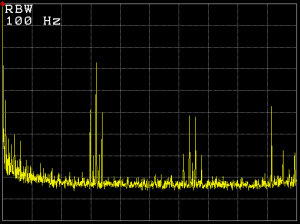 A 1 MHz FFT is required to see the harmonics of this out-of-band noise. The higher the resolution, the greater the level of detail that can be seen above the noise floor. 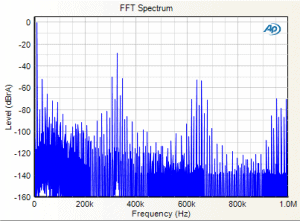 A typical spectrum analyzer may have very wide bandwidth (i.e: able to go far beyond 1 MHz) but the resolution is likely to be 8-bit, meaning many key details of the signal are totally obscured by noise. For example, 24-bit resolution allows low-level out-of-band artifacts to be seen clearly even in the presence of a much stronger fundamental. BW52’s 2.5 MS/s sampling frequency allows APx to characterize square wave rise-times with unprecedented precision. When BW52 is used in conjunction with the AG52 High Performance Analog Generator option (which generates near perfect square waves), power amp designers have the best analyzer in the world for testing overshoot, undershoot, and ringing in the device under test.